Savoy Hotel Frankfurt, Germany. Rates from EUR35. Savoy Hotel is a 4-star hotel that enjoys a fantastic central location in the heart of Frankfurt, directly across from the main train station. This luxuriously modern, family-run hotel offers comfortable accommodation as well as a relaxing spa area with refreshing indoor pool. Guests of the Savoy can look forward to cosy, well-equipped guestrooms and enjoy a free bottle of mineral water upon arrival. Also at the Savoy, guests are able to keep in touch with family and friends via WiFi internet access, available for an additional fee throughout the hotel. A widely varied, delicious breakfast buffet is available each morning in the newly renovated breakfast room (for an additional fee). During weekends and national holidays guests can enjoy breakfast up until 12:00 PM. The Savoy's health centre is found on the top floor and is available for use free of charge. It features a spa area with indoor pool, a gym, a massage service, a relaxation room and striking views of the city. In the afternoon, guests of the Savoy Hotel may enjoy a slice of cake, compliments of the hotel bar, or in the evening, a relaxing after-dinner drink. Location is the best part , close to many attractions. Small size room but comfortable with some nice touches . Plenty of choices for breakfast. Friendly staff . No tea/coffee facilities in my room and elevator was slow. Convenient location , close to Frankfurt main Station and to some nice restaurants. Reception and cleaning staff was really polite and helpful. Good value for money. 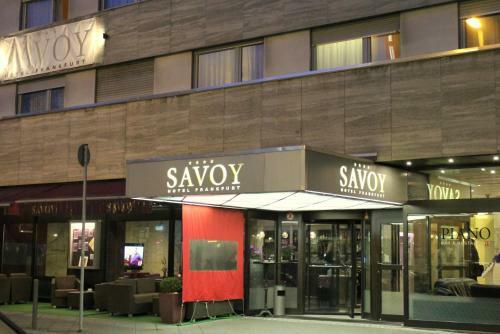 Making your reservation in Savoy Hotel Frankfurt is easy and secure. Simply select your dates of stay and click on the “Check Rates” button to submit the form.